VedicMaths.Org - 16 - Article in this month's teaching children mathematics journal. 16 - Article in this month's teaching children mathematics journal. This issue's article is written by Blidi S. Stemn, Assistant Professor at Northeastern University, School of Education, 50 Huntington Ave, Boston, MA 02115, USA. It is from an article in this month's teaching children mathematics journal. You will see it is about what we have previously called the Vedic Square. The figures referred to in the article are not given here but they can be reconstructed from the descriptions in the text. 56 becomes 11 which becomes 2. I did this activity with a group of 13 year olds in a school in Massachusetts, United States. To generate the Vedic Matrix, I asked the students, each student was given a 9 by 9 multiplication matrix and asked to complete the table. If any of the products in cell was more than 9, students were to repeatedly add the digits until the sum was less than or equal to 9 and the result recorded in the corresponding cell on a separate matrix. For example, 8 x 7 = 56; 56 is greater than 9 so add 5 and 6 to get 11. Since 11 is greater than 9 add the digits, i.e., 1+1 = 2 so 2 is recorded in the cell. After generating the matrix, the students were challenged to find as many patterns as possible. · In the 3rd row or column, 3 + 6 = 9 and in the 6th row 6 + 3 = 9. · In any vertical or horizontal set of numbers, the sum of the first and last numbers is 9 (ignoring the last column and row). For example, in the second row they noticed that 2 +7 = 9; 4 +5 = 9; 6 + 3 = 9; and 8 + 1 = 9. These pairs of numbers can be written as ordered pairs: (1, 8), (2, 7), (3, 6), and (4, 5). With the exception of the 9th row and column, the sum of the numbers in each column or row is 45 and that when you add the digits of the sum the result is 9 (e.g., 4 + 5 = 9). The sum of the numbers in the 9th row or column is 81 and the sum of the digit is 9. · If you add the first and the last numbers in each row or column you get the following sequence of numbers: 10, 11, 12, 13, 14, 15, 16, 17, 18. When you add the digits you get 1, 2, 3, 4, 5, 6, 7, 8, and 9. · The first four numbers generated in the 7th column and row, again ignoring the last number in the column and row, are odd numbers (i.e., 7, 5, 3, 1) while the next four numbers were even (i.e., 8, 6, 4). · The numbers in the 1st row or column are the reverse of the numbers in the 8th row or column (without taking into account the 9th row and column). This is true for rows/columns 2 and 7; 3 and 6; 4 and 5. There are twelve 3s and twelve 6s, twenty-one 9s, six 1s and six 8s, six 2s and six 7s, and six 4s and six 5s. Now let us examine some calculations using the above data. One of the fascinating things about this activity is that opportunities exist for making numerous connections among different mathematics concepts at multiple grade levels. Many students identified a variety of number patterns and their relationships. For example, some found that in the 3rd row, 3 + 6 = 9 and in the 6th row 6 + 3 = 9. Similarly, others noticed that in any vertical or horizontal set of numbers, the sum of the first and last numbers is 9 (ignoring the last column and row). For example, in the second row they noticed that 2 +7 = 9; 4 +5 = 9; 6 + 3 = 9; and 8 + 1 = 9. These pairs of numbers can be written as ordered pairs: (1, 8), (2, 7), (3, 6), and (4, 5). Some students pointed out that the sum of the numbers in each column or row is 45 and that when you add the digits of the sum the result is 9 (e.g., 4 + 5 = 9). Others noted that the first four numbers generated in the 7th column and row, again ignoring the last number in the column and row, were odd numbers while the next four numbers were even. Figure 3 contains some samples of students' conclusions or observations. An implied premise in the use of the Vedic Matrix mentioned earlier is that when connected, numbers form symmetrical shapes (Nelson, et al, 1993; Shan & Bailey, 1991). To investigate this premise, we asked our students to work in pairs. One student was responsible for connecting all the 1s, 2s, 3s, and 4s with a straight line while the other partner connected all the 5s, 6s, 7s, and 8s. To connect each number, the students placed a tracing paper on the final matrix (Figure 2) and marked off each number using a dot. Next, they connected all the dots with a straight line making sure that all the points are connected. We did a whole class demonstration on an overhead. After the demonstration, the students completed connecting the rest of the numbers and compared their shapes with their partners. Figure 4 shows the shapes of 1 and 8 when connected with a straight line. Before they could complete drawing all the shapes, many students noticed some important connections between each pair of numbers. For example, they found that the shapes of one and eight were reflections of each other. Similar observations were made about (2, 7), (3, 6), and (4, 5) as shown in Figure 5. Some of the students conjectured that two shapes are a reflection of each other provided that the sum of the numbers they represent equals 9. For instance, 1 and 8 are reflections of each other since 1 + 8 = 9. These observations and conjectures about reflective symmetry indicate that for each horizontal set of numbers, there is an identical vertical set of numbers and in each pair of numbers, one is the reverse of the other. In addition to the above observations, some of the students identified different geometric figures they found in their shapes such as triangles, rectangles, octagons, etc. We have included samples of students' responses as figure 6. The more I look at the Vedic Matrix, the more patterns I find. There will be two Vedic Mathematics talks at the Natural Health and Ecology Show, 2nd, 3rd June (one talk on each day) at Ryton Organic Gardens near Birmingham, England. 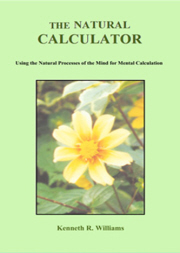 There will be a stand for Vedic Mathematics at the show and books will be available. Andrew Nicholas gave a talk on Vedic Mathematics at the 9th SEAL (Society for Effective Affective Learning) Conference at The King's School, Canterbury, Kent, UK on 30 March. The talk was very popular with people being turned away as there was not enough space for everyone. Members of SEAL are generally people who are looking for new educational forms and they enjoyed the presentation enormously.. Word went round the conference that this mathematics was something special. One lady from Russia, who could not attend the talk, wants to invite Andrew to give a presentation there. After the conference Andrew went to China where he researching for his new book, a novel about ancient lost knowledge. We understand the workshop at the International Centre, Goa, India was a big success and hope to give more information about this later. As interest grows in Vedic Mathematics we get more inquiries from people wanting to attend courses or contact others. What is really needed is a country by country list of those active in VM so that we can put inquirers in contact with those near them. We would therefore like to make a list of people in each interested country so that we can put people in touch. Please send your email address and country to us if you would like to be put on a list and also include any other information you like (your area or city would be useful). Then when we get an inquiry from your country we will pass this information on to the inquirer. HAVE YOU BEEN UNABLE TO SEND YOUR EMAIL? Recently we have found that our site Email addresses have not been forwarding messages to us. We are very sorry for any Inconvenience this might have caused. Therefore we may have not received some Email messages sent to us. Hopefully we have now corrected this problem and have also put up alternative Email addresses (just in case). EMAIL: I have been contacted by a teacher in Florida as per your recommendation and we are discussing some ways we can make vedic Math more popular in our respective areas and possibly across the country. I am thinking about forming a study group on Vedic Math. I hope I can get the approval to teach a course in VM. I intend to do a workshop first and then push for a course at my present university or elsewhere. VM is so fascinating!!!! REPLY: In spite of the obvious merits of the Vedic system it is taking a long time for it to be properly appreciated, though things have picked up a lot in the last couple of years. I think there have been a small number of VM doctorates in India and I am not aware of any standard college courses in Vedic Maths: we are not quite there yet. There have been many courses in many countries but nothing regular as far as I know. The United States seems to be lagging in appreciating VM. Vedic Mathematics is part of a course in Edinboro University of PA, USA. You may want to contact Dr Blidi Stemn at Northeastern University, details below, who is keen to promote Vedic Maths. EMAIL: Are you aware of any workshops or talks on Vedic math in U.S this summer or in the next academic year ? I will appreciate getting any info. on this.Thanks. Newsflash - Two courses start soon in Manchester, England. 18 - Luigi Di Martino article on the Vedic Square and divsion. Newsflash - Presentation on Vedic Mathematics, Madison, USA. 19 - "MATHS MANTRA" article from Pune Times of India. Newsflash - Workshop on Vedic Mathematics at Ruparel College, Mumbai.